The Manufacturer Connect Event: June 2017. 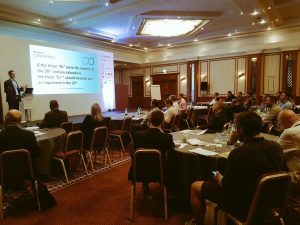 We were delighted to be partners with The Manufacturer for the new-look Connect event which brings together ERP, BI, CRM and FSM topics and solutions all in a single event. 3. Hear about what other manufacturing companies are doing and learn from their experiences: with keynote speaker sessions covering a range of topics including digital transformation at Laing O’Rourke and BI initiatives at Rolls Royce supplemented with insights from manufacturing and project delivery experts. For ourselves at Optimum, it was a great opportunity to deepen our knowledge and understanding of the key priorities for manufacturing companies at the moment in terms of their business systems and to keep abreast of solutions and initiatives across the sector. There is a lot of change and disruption happening – so at Optimum we really need to home in on what digital transformation and Industry 4.0 really means and looks like for the majority of manufacturing companies and how we can be best placed to help them on that journey with our project management, change management and solution management expertise. And how the traditional ERP / CRM / BI projects fit within the new industrial transformation programmes. In our workshops, just as we hope to provide insight and value to attendees, likewise for us it is invaluable to get that interaction and engagement and hear directly about what’s happening in a wide range of manufacturing businesses. – Graham Herries (Laing O’Rourke) – Really interesting insights into their approach to digital transformation and the increasingly pivotal role of data these days. But also how cross-sector learning and collaboration is really important – with some great examples of some collaborative projects across construction and manufacturing. – Alan Griffiths (Cambashi) – Valuable overview of technology developments with the Internet of Things and Cloud Computing and real-world applications in the manufacturing sector. As well as really useful overview of solution providers across this space, large and small: haven’t seen this covered at any other events, and just like with business systems, there is a dizzying array of solution options and vendors, so I would imagine attendees found that very useful too. One of the Connect series strengths is how it provides a perfect forum for manufacturing businesses to network and share ideas with each other and yet again this proved to be the case whilst the attendees enjoyed their lunch in the sunshine over Birmingham. One of the key reasons that Optimum PPS are delighted to be partnering with The Manufacturer is that they share our commitment and drive to help the industry collaborate and thrive. A new innovative service from The Manufacturer that holds this ideal at its very core is The Collaboratory –a private space / digital forum for manufacturing businesses across the UK to discuss their experiences, share advice and learnings and offer up support to each other. We look forward to seeing how this develops and grows. If you like the sound of the Connect event then please join us at the next one on 5th October – get in touch here.